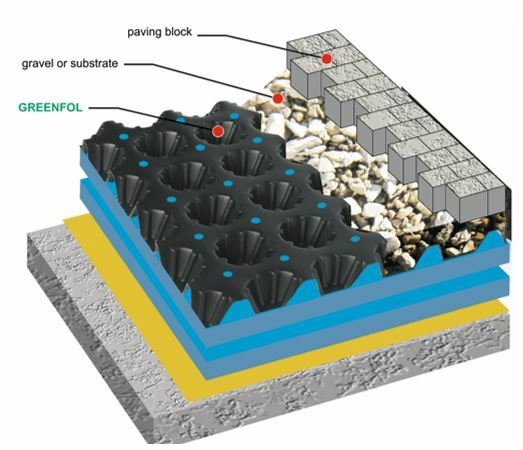 GREENFOL is a series of dimpled geomembranes, intended for the construction of green roof systems. Made with the surface mass of 600-1000 g/m2. When geomembrane is laid on the roof surface its top side forms a water reservoirs of the nominal capacity of up to 7 l/m2. The bottom side, through its dimples of 20 mm high, creates an air gap providing the air flow and draining the excess water to the green roof gutter systems. 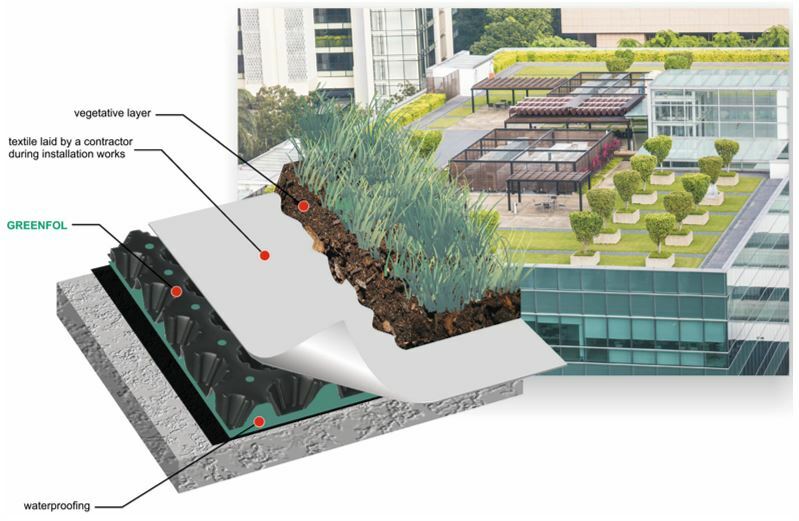 Specially developed dense perforation of approximately 400 holes/m2 in the top part of the membrane, ensures the excess water to flow to the bottom (drainage) side of the green roof system, preventing water retention in the form of spills during heavy rainfall or autumn-spring season. The construction also allows to fill dimples with, for example, gravel or other aggregate thus increasing several times the resistance to pressure. When a project provides the use of an integral separation-filtration layer in the form of any kind of geotextiles, the unique “ribbed” design of dimples provides excellent strength exceeding 250 kN/m2, and this allows the use of GREENFOL membrane for the construction of green roofs designed for pedestrian and light vehicular traffic. GREENFOL membrane is supplied in rolls. Its installation is done by simply laying on the protected surface. The membrane shall be overlapped. Each of joined sheets shall overlap by a minimum of one row of dimples. The installation process must be scheduled in such a way as to reduce membrane cutting, to avoid damage to the dimples. The membrane can be laid along as well as across the covered surface without losing its hydraulic and mechanical properties. When installing the membrane in order to protect it from uplifting during wind gusts and from overheating during intense sunlight, the membrane shall be ballasted with water. Before laying the membrane, previously completed construction works have to be accepted, for example, thermal insulation, damp insulation, rain water collecting system installation, etc. The water collecting dimples can be filled with appropriate aggregate, for example, gravel. The top surface can be separated from the substrate layers with a suitable geotextile. When using our geomembranes, always follow the installation guidelines contained in the work technical design. 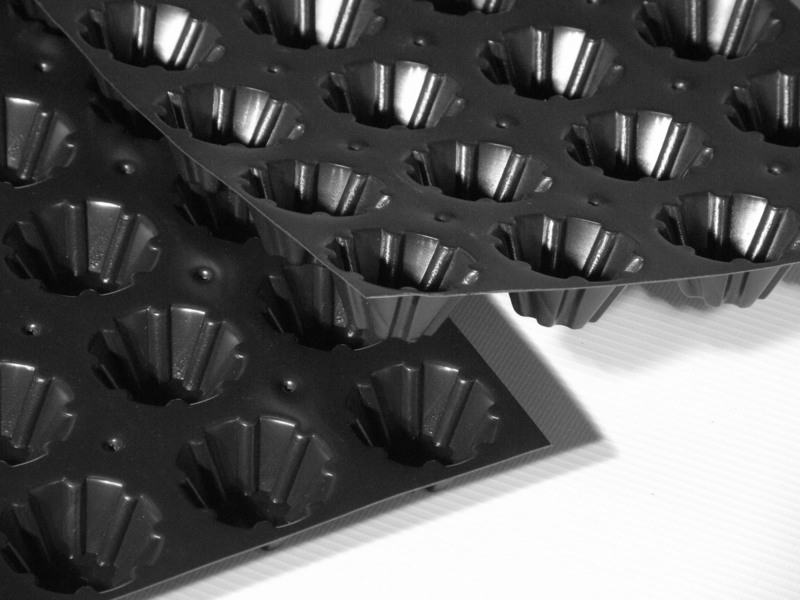 GREENFOL membranes are supplied in rolls with a width of 3 m, rolls are secured and labelled, and CE marked. During transport and storage, the product should be protected from mechanical damages and high temperatures. For longer storage periods, membrane rolls shall be stored upright.